A podcast about all things Macintosh. For Mac geeks, by Mac geeks. Show 178. Quantum Research says iPhone is OK. Apple, others sued over MP3 iPhone “Hello” ad on Oscars. Apple planning a Bluetooth headset for iPhone. Some iPhone rumors. Ms. Pac-Man is now on iPod [iTunes]. Apple delays AppleTV until mid-March. BBC planning on-line broadcasting, but not to Mac owners [petition]. Simplifying managing a “mobile” and local iTunes Library. More tips for improving wi-fi. Review: Pen-It from Maxell/Hitachi. Resolving Finder crash issues. 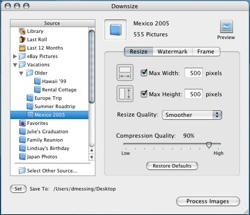 Viewing PSD files without Photoshop. Using network drives using new Airport Extreme. Cloning a user account. The right DVD/CD media makes a difference. iTunes Album playlists are in reverse order. Get in the Maccast Loop [iTunes]. Some of you may not know this, but I am extremely disorganized, both in the real world and in the virtual one. You can not see the top of my desk and I often loose files on my computer because I forget where I put them. Enter DEVONthink. DEVONthink is a complete information manager with a powerful artificial intelligence (AI) architecture. You can use it as a document repository, filing cabinet, email archiver, web page archive, project organizer, and more. Essentially, it is a database for your digital life. Two versions, DEVONthink Professional and of DEVONthink Professional Office, have just been updated to version 1.3. The updates to Office include, the addition of a few new languages, drag-and-drop import of UNIX mailbox files, more reliable OCR, interface bug fixes, plus additional added features. The Professional version has better support for both AppleScript and Firefox, additional new key combinations to allow easier PDF file navigation, an improved search and history window, with many other enhancements. DEVONthink Professional Office is the more robust of the two products and has a few more features than the Professional only edition to start with. Both 1.3 updated versions are now available for download from www.devontechnologies.com and can be used for 150 hours on a trial basis. If you decide to make a purchase, DEVONthink Professional Office is USD$149.95, but if you are already a DEVONthink Personal or DEVONthink Professional, an upgrade is available for USD$70.00 or USD$110.00 (respectively). DEVONthink Professional will run you USD$79.95, with a upgrade license from DEVONthink Personal available for USD$45.00. Final Cut Pro’s real-time playback features save a tremendous amount of time while working on projects. Add a transition here, a video layer there, or tweak a filter, and you need not worry about rendering the results just to confirm everything works as expected. But even on the most powerful Mac hardware real-time playback has it’s limits, as it is truly a real-time previewing system. Situations requiring rendering to view, no matter how good the Mac is, include: complex or rich video projects containing many video and audio tracks (especially if the project is HD), clips with multiple filters applied, or projects that incorporate native Motion or LiveType project files. When content in a Timeline sequence requires rendering, red bars appear above the Timeline’s ruler bar (See Figure 1). Figure 1: Clip with Multiple filters applied showing render bars. Downsize by Stunt Software, nowâ€¦ what can I tell you about this clever little application? Well, so that I could give you a really good insight into what it offers, I have been using it for the past month. You may well have noticed that all of the images on the Geekanoids site changed. They now all have borders, with rounded edges and a nice subtle shadow, a nice uniform lookâ€¦ all courtesy of Downsize. The application window is just so easy to get to grips with. 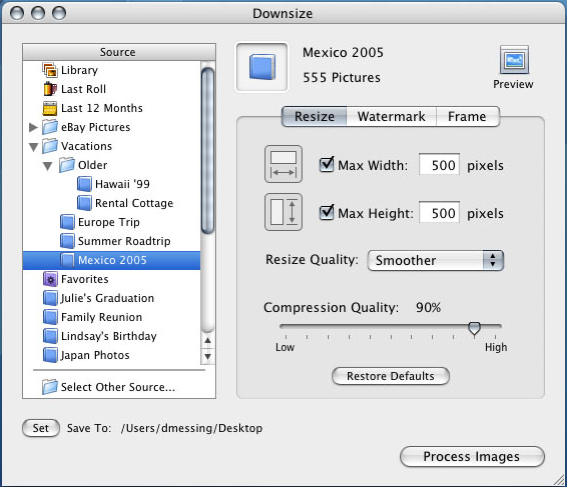 On the left hand side you select the source of your images, this can be from iPhoto, a particular folder for batch processing, or you can just drag a single image into Downsize. You can also set a destination folder for your finished images. The right hand panel consists of three tabs, resize, watermark and frame, each determining how your image will look. Apple has posted their new iPhone teaser ad titled, “Hello” on Apple.com. The new commercial aired last night during the 79th Annual Academy Awards. The ad shows a series quick cuts from films and TV shows where the characters are answering the phone and saying “hello”. The spots end with a rotating iPhone, the text “Hello”, an iPhone image, a message that says, “Coming in June”, and a white Apple logo. Interestingly, there is no URL and no text that would indicate the name of the product, iPhone. Personally, I felt the ads probably had little or no impact on anyone who isn’t already aware of the iPhone. Obviously Apple used film and TV images to tie in with the Oscars, but I didn’t find the ad very exciting or compelling. In case you missed it the ad is now available for viewing on Apple’s iPhone page. Well, looks like the rumors were true, The Wall Street Journal is reporting that Apple has delayed shipments of the Apple TV until mid-March. Apple does not seem to be providing many details on why the product isn’t going to ship this month as expected. Apple spokesman Lynn Fox simply said that Apple is finishing up development and it is taking a bit longer then expected. Guess all that iTunes content will be stuck on your Mac screens for a couple more weeks. The pilot episode of the new Maccast Loop. “The Loop”, is a brand new show and will be produced in addition to the Maccast you have come to know and love. What is different about the Loop vs. other podcasts is that it is recorded live each Sunday at 10:00 AM PST/1:00 PM EST. Using the Talkshoe network and technology we are able to offer live audience participation using text and audio chat. Each week in the Maccast Loop I will go more in depth on the hot topics from the prior weeks Maccast and also take questions directly from the audience. The Loop narrows the gap and closes the loop between podcaster and audience, making you more a part of the show than ever before. If you missed this first edition don’t worry, it’s still a podcast. You can subscribe in iTunes or by using the links above and then join us live next week. I really hope you like this new addition and thanks for listening. Maccast Loop kicks off in 10 hours! The pilot episode of an all new Maccast begins in just 10 hours. The Maccast Loop is your chance to be a part of a brand new kind of Maccast. Each week I get such great feedback, comments, and email from you, but I am not always able to cover it all. I also receive questions and comments that turn out to be a bit too specific or niche for me to cover on the main show. “The Loop” is here to take care of that. Each and every Sunday morning at 10:00AM PST, myself and Loop producer, Victor Cajiao (Typical Mac User Podcast [iTunes]), will be taking your calls and discussing your feedback, comments, and reactions to the past few episodes of the Maccast. We will also get into any topics and conversations brought up live as we record the show. If you choose to participate, head over to Talkshoe.com now and sign up for an account. Then, just call in to the conference on Sunday and you can be a part of the show (see details on Talkshoe). It should be a lot of fun. Don’t worry if you can’t make it live because the show will also go out as a podcast. Look for it on iTunes or here once the RSS is ready for the first episode. 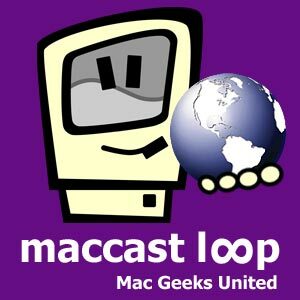 Maccast Loop, Mac Geeks United. 17″ Powerbook LCD bug, literally! 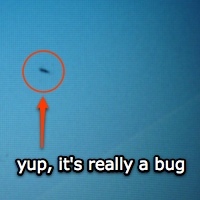 So we all know that Mac LCDs have been occasionally known to have bugs, but this one might take the prize. Listener Jay was disappointed one day when he saw a dead pixel in the lower left portion of the screen on his 17″ 1.33GHz G4 PowerBook. So imagine his shock and amazement when, while searching for a replacement LCD on eBay, the dead pixel started to move. Turns out he literally had a bug in the display. The poor little guy appeared to be trapped within the layers of the screen, possibly between the backlight and main panel. He made a daring effort to escape his confines, pausing briefly near the center of the screen, and mustering just enough strength to get to the upper right before, alas he died. Now Jay has a 2mm long black fuzzy line in the upper right quadrant of an otherwise beautiful 17″ powerbook screen. Has anyone else heard of this happening before? I would guess that the poor guy somehow became encased in there during manufacturing, possibly even as an egg. But, look at the bright side, if you had to be trapped in a computer wouldn’t you rather be trapped in a Mac? 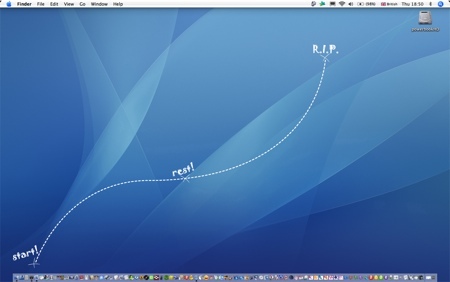 One of the early “Get a Mac” ads featured the Mac being able to communicate with a new digital camera while the PC just looked on, bewildered. Apple computers are supposed to “just work.” Yep, they “just work” with some peripherals if you happen to have a USB cable handy. Why is this the case? Apple has always been an innovator. They dropped the floppy disk drive much earlier than other PC makers, included wi-fi in their laptops before many others and of course, Apple’s industrial design has influenced many other computer makers. But for some reason, Apple has not integrated a media card reader into their laptops, nor their desktop lines. I own a MacBook Pro, and a couple of more slots on the side of the laptop would not look odd or ugly. iMacs could also benefit from a few slots for SD or CompactFlash cards artfully placed below the CD/DVD drive. It’s absolutely inexcusable that the Mac Pros do not have such slots. These are pricey computers; they should have features that are available on low-end PCs. However, I am not sure where on the Mac mini Apple could place easily accessible multimedia card slots. You would think that since Apple is geared towards the creative, with software like iPhoto and iMovie, that there would be an easy, USB cable-free way to get the data on to your Mac so you can create. Who wants to search for cables when creativity strikes? If you have a MacBook Pro and are dying to have a card reader, there’s a solution from Belkin that keeps your MacBook Pro’s form factor intact. You can view the product over at Belkin’s site. 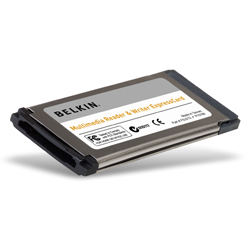 As of this writing, Belkin is out of stock of their multimedia card reader.